A special occasion calls for a special celebration. To make your event truly memorable, Metro Music DJ Service in St. John's and the Avalon area offers you a professional sound system, laser lighting and an all-encompassing music selection. We've been around for 15 years, and we love sharing and enhancing the moments of joyful celebration. For our reliable, on-time service, we quote you a flat rate upfront. That's right, no hidden costs! We don't charge by the hour, so you won't be surprised when you see the bill. What's more, if your party keeps poppin' an extra hour or so, we'll still be there pumpin' out the tunes at no extra cost! Just like you and your guests, we're all about music! Let us bring your event to life and turn it into a great memory for the years to come. 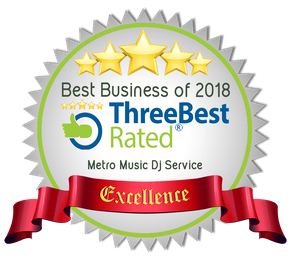 Whether you're organizing a party for coworkers, family or friends, our friendly, professional Disc Jockey and our extensive collection of songs will get your party going. With 20 years of entertainment experience, we've helped organize hundreds of weddings and other events. We know how to play with the dynamics of the room and boost its energy with high-quality sound and laser lighting. Organizing a charity event or fundraiser? We offer discounts!